Yippee! and Yahooo! I’m glad you stopped by this letter identification worksheet for the letter y! There’s a picture of a big furry fella (yes, it’s a yak) on this page. Got a photo of him the last time I was in the Himalayas and framed it with the words, “Yikes! It’s a yak.” just because they’re so uncommon. 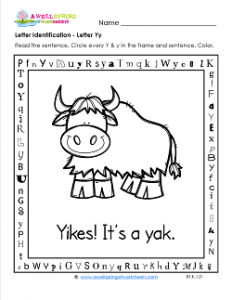 Well, now your kids can learn letter recognition skills with this yak and the letters on the frame. There’s 12 letters on the frame, three on each side and two in the sentence. Have your kids circle the y’s. Then they can look for the hidden sight word “so” on the bottom side of the frame. Don’t forget to color my beautiful yak!